You can hit the plus in front of any family listed in View/Pay Family Invoices to show three detail tabs. The first tab lists any invoices for the family that has an Open status. They may have had a partial payment, but have a balance and therefore the invoice is still OPEN. The second tab lists all PAID (Closed) invoices. These invoices have a zero balance. There is now a Third tab which lets you pull the ledger of all invoices and payments for the family. At the top of the tab, you can set the date parameters to see the invoices and payments you want. Invoices paid from date will allow you to show any fully paid invoice that was paid from that date to today. Invoices due until will show any invoice due up until the date entered. 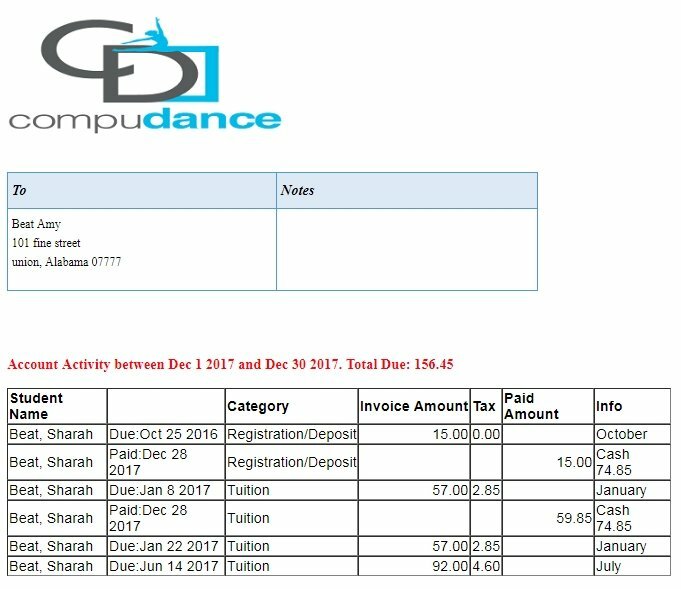 If an invoice is still open, whether it has a partial payment or not, if it was due prior to the Due until date, it will be listed. You may generate a statement to Print or Email for the family. When Ledger data is displayed in the table, you can click Print Statement to see the full statement created for that family, or Email statement to have it sent to the family email address in the family link page and the studio will also receive a copy.